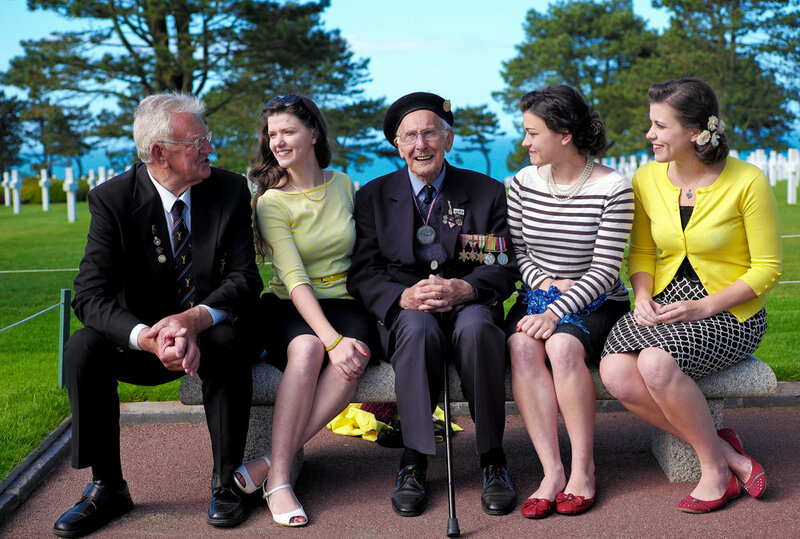 One of the most delightful experiences I (Jubilee) have had while in Normandy was meeting Mr. Herb and Ed Griffin, brothers and both veterans of the Second World War. Mr. Herb Griffin landed at Utah Beach on D+10. Despite having been taken, the beach still had many un-detonated mines. As one of the 79th Infantry Division, Mr. Griffin helped to take Cherbourg. Shortly after the liberation, he was badly injured in the arm by an 88 and was sent to a hospital in England for recovery. Mr. Ed Griffin did not land in Normandy because he was too young at the time (he was two years junior of his brother), but served later on in the war. Herb Griffin as an 18 year old soldier. Mr. Herb Griffin had always wanted to return to Normandy, but never had the opportunity until an unlikely meeting with the fire department when they rescued him after he became unconscious in church. On the way to the hospital, they started talking about his war experiences and a special bond grew between veteran and firefighters. The providential meeting ended up with the firemen raising enough money to send not only Herb, but also his brother Ed, back for the first time to the beach he landed on 70 years ago. It was simply wonderful to get to meet them. Faith offered to sing a song from the WWII era for them and Mr. Griffin picked, “It Had to be You.” We were thrilled to see how much they enjoyed the song and even just talking to us. Memories like these are absolutely priceless, and I am so grateful to have been able to meet these two kind and wonderful veterans. Taking photos in foreign lands can be quite amusing.